PANAMA CITY BEACH, FL--(Marketwire - Feb 15, 2012) - On March 6, a five-bedroom home in Bay Point, one of Panama City's most prestigious communities, will sell at a real estate auction with no minimums and no reserves. The home, which overlooks the waters of the Grand Lagoon, will be offered by J. P. King Auction Company. The Bay Point community is host to two 18-hole golf courses, the Bay Point Marina and Yacht Club. It also offers waterfront dining and entertainment options and world-class boating and fishing. "That's one of the things we enjoyed the most about Bay Point," said Doug Fabick, who owns the property with his family. "There are several restaurants on the property. You don't need a car, and you don't have to leave the complex. Everything you need is right in the community, and it's either a short boat ride, golf cart ride or walk away." Apart from the community's amenities, the Bay Point Estate itself offers an open floor plan, an abundance of windows to capture the views of Grand Lagoon, a hot tub, solar-heated pool and a wood deck with awnings extending from the patio to the water's edge. While Fabick recalls enjoying parties with 60-80 guests in the main living area, it was the serenity and privacy that he appreciated the most. "There's nothing like waking up, sitting on the back patio with a cup of coffee, and watching the boats leave in the morning, the fish jumping, or a sunset at night," he said. "The view there that overlooks the marina is as good as it gets." 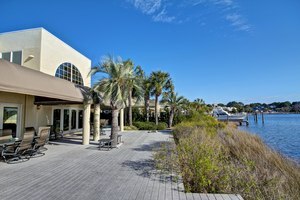 The auction will take place on Tuesday, March 6 at 11 a.m. at the Wyndham Bay Point Resort's Spanish Moss Room, located at 4114 Jan Cooley Drive in Panama City Beach, Fla. Property tours will begin on February 21 and continue through auction day. For additional information, individuals may contact J. P. King at 800.558.5464 or visit the company's website at www.jpking.com. About J. P. King: J. P. King Auction Company specializes in high-value properties and portfolios such as luxury homes, developments, condominiums and land and ranches. The company has marketed properties in all 50 states and six countries with recent sales in Colorado, Kentucky, West Virginia, Oklahoma, California and Montana. A five-bedroom estate in one of Panama City Beach's most prestigious neighborhoods will sell at an absolute auction on March 6. The home provides views of the Bay Point Marina and Yacht Club through large windows and a large deck, overlooking Grand Lagoon. It also has quick access to the Gulf of Mexico. Take a video tour of the Bay Point Estate, selling at auction through J. P. King Auction Company. For more information, visit www.jpking.com.